Nine countries are represented among more than ninety current students and alumni in the Maddie’s® Online Graduate Certificate. The Maddie’s Online Shelter Medicine Certificate literally spans the globe! 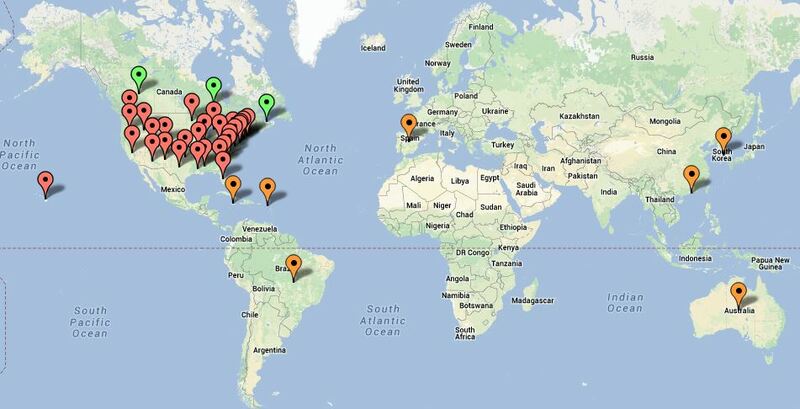 Click on the map for more details on where our current students and alumni are located. Maddie’s® Shelter Medicine Program is spreading shelter medicine knowledge across the globe! More students than ever are learning about a variety of shelter medicine topics through our comprehensive online courses. Supported by a grant from Maddie’s Fund®, our on-campus shelter medicine certificate program has been tailored for the virtual world as the Maddie’s® Online Graduate Certificate in Shelter Medicine. This customized online education program gives our curriculum a broader audience, benefits more homeless animals, and supports the expanding graduate and veterinary student interest in this evolving topic. Since launching in 2012, the Online Graduate Certificate in Shelter Medicine has expanded to include more than ninety students and alumni representing twenty-nine states and nine countries. An international reach demonstrates the growth in shelter medicine as a specialty area of veterinary practice. Shelters and veterinary professionals are eager to understand the tools and knowledge necessary to improve the lives of homeless cats and dogs. With three certificate courses delivered online, students across the globe are learning these skills directly from leading shelter medicine experts. Students and alumni of the Maddie’s Online Graduate Certificate span countries and continents! Online Graduate Certificate students gain crucial knowledge in the field of shelter medicine through online lesson plans and virtual discussions. This unique community fosters lively collaboration and shared experiences between classmates, encouraging the discovery of new ideas and different perspectives. The certificate’s comprehensive approach enables every student to experience an in-depth exploration of a wide variety of shelter medicine topics. Want to know why the Online Graduate Certificate in Shelter Medicine is going global? Click here to learn more about our courses or request information about the online certificate.